going in the high series direction. Discussion in '2001-2005 Explorer Sport Trac' started by rokr1292, July 12, 2011. Finally changed my mind about the bag console being okay. Even with 4 cupholders in my current setup, the looks, the functionality, and the inconvenient placement of some things is bothering me. So I bought a high series console shell. I've heard using an explorer console doesn't work with a sport tracs rear blower or whatever, but I never had a rear blower so that doesn't matter to me. I need to know what else I need. Is there anything I can reuse from my current console? The armrest or something? It's missing the cupholder guts for the back, (where the rear vents and controls are which is what the interior tray (also missing) and the armrest pad (again, missing) bolt to.) so even if you don't want rear controls, you still need the rear section. If you don't want a hole there, you'll also need the rear control pod. Also, there is no bracket for the floor to mount it, (that could cross over, I don't know how the short series mounts up) and it has no front cupholders, cargo cubbies, or any of the fasteners. Lots of stuff missing that you'll need... I'd get one that has everything. What should I look for to find the" cupholder guts", tray, and armrest? That black bracket between the sides of the shell isn't that bracket, is it? Or is there something that bolts to the floor that this bolts too. all i really need is the bracket, and the internals, i think im going to make a delete for the rear vents, i just need the inner tray, lid, bracket, and what the tray and stuff mount to (rear cupholder assy?) im gonna make a jy trip sometime this week. If you don't find that stuff at the JY let me know. I can probably fix you up. I have a complete tan Gen 2 Explorer console I can't use and several different "inserts". 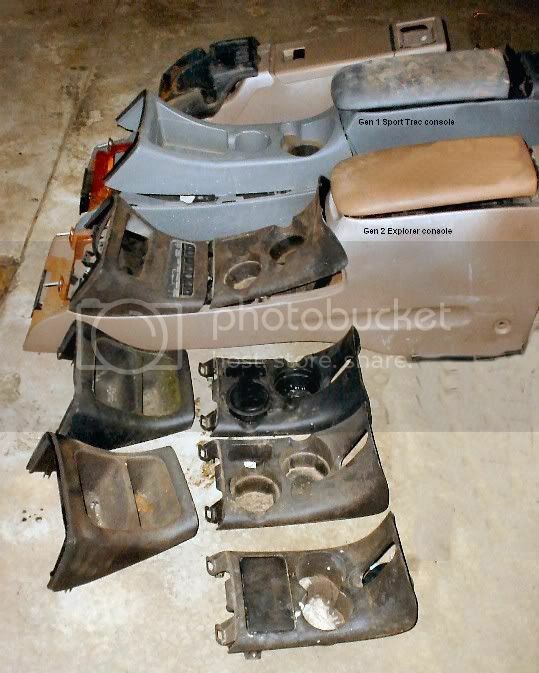 Thanks nranchero, I've heard some other members reccommend you for hard-to-find parts. You'd probably know specifically what I need more than anyone. The JY near me has a bunch of explorers but no explorer sports or sport tracs, and that one piece insert is really what I wanted. Right now i have the siamese cupholder/ashtray part at the bottom of the pic. How much would you want to ship one of the one-piece inserts to 22736? Hell, what would it cost for the rest of what I need too? You probably know what I need better than me, and it'd probably be easier to get everything from one place.